The Information Era is promised as the solution offered by actors to the perceived poor living conditions of the victims in developing regions. However, the needs of actors and victims differ, and it is not wise for actors to assume to know what the victims really need. This is especially true if the actors wish to force down their own world view onto who they perceive to be the "victims", who may have no aspirations similar to those of highly developed regions. The assumptions of actors show a bias toward their own cultures. Secondly, traditional media have not penetrated total populations even of highly developed regions, so even if the new media might contribute positively to the lives of victims, it will never assist an entire population. Thirdly, solutions that work in highly developed regions may not work in developing regions. Developed world, developing world, production, telecommunications, computers, phone lines, radio, newspaper, complex systems, evolution, capitalism, low-tech, African values, colonization. Globalization seems to benefit mostly the developed world, while bypassing the developing world of supposed victims. The grand purpose of globalization is an ideological concept, showing the bias of the actors. Even in developed regions technological access is not "global", and therefore there are victims within those regions as well. The classic theory evolution assumes change has a life of its own, and that only the fittest survive. In an information era, that implies that only the informational fittest will survive. However, such a view assumes a linear and progressivist form of evolution. Given a complex systems framework, causality is not linear, and the quantity of input does not necessarily equal the quantity of output - a small perturbation may cause a huge result, mainly due to feedback loops. The poor of the world may not have the technological or information needs as perceived by the so-called actors, while the high-tech solutions may perhaps not be relevant due to high costs. But even so, if basic needs are not first met, following Maslow, information needs may be irrelevant. After all, if one is continuously hungry, email is not of particular importance. Finding food then has the highest priority, and even if the highest technology is available, it will not be used. Given the present status of technology, there will be no global internetworking systems for at least another half a century - i.e. up to 2050. With global I mean affordable access (i.e. affordable to the locals) in remote areas (eg. in the Sahara, Australian outback, remote villages anywhere in the world). The statement assumes there will be no major breakthrough in communication technologies to reduce costs and to increase footprint dramatically. If the majority of the global population will not be connected by 2050, why bother assisting the victims? I will briefly consider these statements in this paper. The globalization of production, or economy or information implies some statistical majority of people have access to a particular aspect of human endeavours, specifically western capitalist economics. A question that comes to mind is what degree of penetration is required of a particular medium to make that medium global? Is a medium global when 51% of global population has access to it? The world's production is dominated by Western enterprises that account for 64.2% of global production. Production by non-western countries, apart from Japan, is far behind. According to data from the World Bank more than half of the world's production comes from the developed West. Of the world's output, 80% is produced by only 16% of its population - the so-called triad of Northern America, Developed Europe and Japan. And of that 80%, some 64.2% is produced by Europe and Northern America. The few thus carry the many. This same pattern can be observed in terms of the use of technology, such as radio and newspapers. Consider the "old" technologies such as radio and newspapers. One would think that after a few hundred years of newspaper existence and after close on a century of radio there would be global access to these technologies. Yet the developing world lag far behind the developed world. The developing world has six times as many newspapers per 1'000 people and four times as many radio sets than developing nations. Even in developed countries these established "old" technologies have not penetrated 100% of populations. 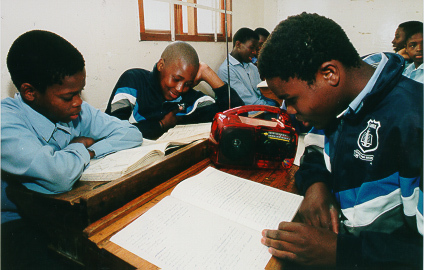 In the developed world, 87% of the population have radio sets, which means that 13% do not have access to radio. Only 27,9% read newspapers -- which means that more than 70% do not read newspapers. There is no true globalization even with respect to newspaper and radio sets, despite the long existence of these technologies. If 51% constitutes a majority, then perhaps in the developed world the majority of people may access radio, but the majority does not access newspapers - a technology even older than radio. As the data in Figure 3 shows, the situation is far worse in the developing world. If access in traditional media is so low in the developing world, by what argument will the uptake of new media be any better? Why is there so much effort to establish the new media for use by the victims in developing regions? The infrastructure for sophisticated communication networks is lacking in developing countries - there is not enough copper or fibre. Even if there is a political will in these countries to join the information era, and the picture seems rather bleak concerning political will, there is no return on investment for connecting remote areas, so what would the argument be then for connection? It surely cannot be an economical reason. In the developed world there are 540 phone lines per 1'000 people, thus half the population has access to a fixed landline. In a developing region such as southern Asia more than 70 people must share a line, and in Sub-Saharan Africa the situation is worse. Statistically speaking, even in the developed regions there is not a line for every single individual. The situation with PCs in the world is even worse than radio sets, newspapers or phone lines. In the developed world there is access to PCs for between 20 and 25% of the population -- thus one PC for every four individuals. In developing regions such as Central Africa and Asia there is one PC for every two hundred people. Clearly, PC access in the developed world proliferate, while it is very scarce in the developing world. From the above we can conclude that the globalization of economy and telecommunications is an affair of a minority group, the actors. 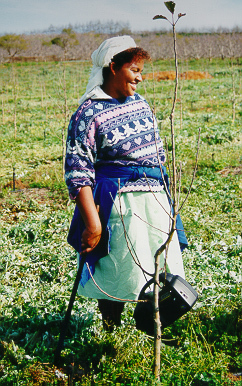 The majority of populations maintain village economies, and have little access to technology. This may seem self-evident, but note that even in developed nations technologies are not necessarily used by the entire population. Consider the situation in the USA -- which presently carries about 70% of the world's internet traffic, and generates an even larger proportion of the content on the Web. The most popular communication technology in the USA is TV, yet 2% of households (several million) do not own TVs. And despite the hype about the Internet, it is available to only about 10 - 12% of the population, which means that it is not available to about 90% of households. Only 33% of the US households have access to PCs (about 70% do not), yet some commentators talk about a global computer era. Granted, many members of households that do not have access at home, have access at school or business, but the total access is still less than half the population. The actors - from the developed world - now have a drive to get the world of victims connected. This may sound like a noble cause, but is that what is really needed? Almost 20% of the world's population live on less than $1 per day. If you had to live on $1 a day, would you really be interested in getting connected to the information super highway? From our cushy sofas it is easy to impose our "needs" onto others. Given Maslow's (1970) hierarchy of needs, when you do not have enough to eat, such technologies seem as irrelevant as distant planets. Email is not significant when one goes hungry day after day. There is a long list of needs between basic safety needs (such as satisfying hunger) and satisfying knowledge needs. The drive to bombard developing nations with technology reflects the needs of the actors, not the victims. Poverty makes nonsense of supposed technological needs. It seems somewhat misplaced for actors to assume that technologies that work in the highly developed world are relevant to the needs of the victims of this world. Given the classical theory of evolution, only the fittest survive, caused by "natural selection". If it is natural for only the fittest to survive, and if that is a given evolutionary fact, then why bother interfering with natural processes? In other words, why should the actors be bothered to assist the victims? When the fossil record is considered, by far the majority of species became extinct. In fact, only about 2% of all specied that ever lived still exist (Raup 1992). Extinction seems to be the normal course of history. From this it can be concluded that there is not much to be done about extinction - even of societies, as atested by previous empires and civilizations that no longer exist. So if the developing world does not catch up, it will become technologically extinct, and if the information era is really where we should be in order to survive, extinction may refer not only to victims of information depravity, but even to physical extinction. One way to deal with this is to accept the futility of fighting fitness for survival and ignore the poverty of brethren from the developing world: ignore physical as well as informational deprivation. Given the view of classical capitalism and notions such as supply and demand, this may indeed make sense. After all, aggressive competition is the hallmark of western corporations. But the question then is, does the classical capitalist theory still operate in practice, and the answer seems to be "No!". Capital used to be in the hands of oil barons and the individual magnates of massive industries. Now capital seems to have been democratised and in the hands of pension funds and organizations consisting of not a single owner, but a multitude of shareholders (Drucker 1993). Social groups now run the world. There is a bigger problem with classical evolution theory, as well as classic economic theory. Both are based on a linear theory of causation, which is simplistic, referring to idealistic closed systems, and do not reflect the complexities of real life. According to complex systems theory even subsystems weak at initial conditions may tremendously influence the outcome of the total complex system, as found in cliché statement: the flap of a butterfly's wings in Central America may "cause" monsoon rains in India. This notion demonstrates the sensitivity of complex systems to even the weakest link in the chain of causality. A complex systems perspective on social systems thus demands that actors support victims, not for hte sake of western economics, but for the sake of human survival. Given a global perspective of evolution and economics, in the big scheme of things the weak links of developing countries may influence the outcome of the total system. We have seen something of this in the slump in the Asian market which affected even the powerful regions. The situation of the victims can influence that of the actors. We are all connected, and thus indeed live in a global village. This is why the actors should bother to assist the victims, but then not in the cultural terms of the actors. The terms must be acceptable to the victims. In fact, the victims should drive their own terms. Given the traditional or classical set of assumptions, we can ignore the plight of the developing world. We can leave them alone as only the fittest will survive; we leave them to die, as they will die anyway. But this linear and mechanistic view of the world has been challenged by a complex systems viewpoint. Given a view that weak systems influence the outcome of strong systems, it would be shortsighted to ignore the state of victims. From a chaos theory perspective the actors form one basin of attraction, and the victims another. If classical economics and evolution are the basis of the dominant theory of mankind, it seems that the basin of attraction of the actors dominate at the moment. Given the relatively long period of world peace since the Second World War -- of course there have been thousands of small upheavals, but I am now talking of multinational wars -- economic growth patterns and technological developments, we tend to accept that basin of attraction as the ultimate. However, if in the long term the system oscillates to another state there is no guarantee that that basin will remain the main basin of attraction. There is no guarantee that general human conditions cannot come to a general state of equilibrium which may be the state of the present victims. Roles may be reversed (following catastrophe theory - Woodcock and Davis 1978) when victims become actors, and actors the victims, although not because of the same forces that resulted in the present state. All we need is some form of external energy that can wobble the system into such a state that all our comfort zones are removed. A global disaster in the form of an economic crash, bad crops, natural disasters such as major floods, earthquakes, or even an undetected meteorite of gigantic proportions, can shake or even destroy our cozy little developed corners. The present victims will have much better surviving skills under such conditions, and all the technological advances of the present actors will be wiped off the face of the earth. There is thus no room for gloating or pride, or looking down on present day victims. There is thus a case for actors to assist victims, despite what adherence to classical evolution theory might suggest. I did state that the assistance should not be on the terms of the actors. Here are some reasons why not. The main reason is of course to avoid some form of neo-colonialism. To force down technologies regarded as important by the actors would merely be a modern version of the arrogance of European colonizers. From a certain perspective technological actors are psychological victims. Roles can therefore be reversed and technological victims can serve as the actors to teach different values to the psychological victims. From an African perspective, the emphasis of technology used by individuals would be regarded as an inferior value. Consider, for example, some of the values that the developed world seems to have forgotten, but still found in Africa (Mutwa 1964, Paris 1995). Helping one another (i.e. beneficence) is part of the moral fiber of African societies. To the western outsider it may be amazing how someone may endure hardships to help another. In South Africa the system of "stokvel" (pronounced "stock-fell") is used by low income individuals who put most of their monthly income into a kitty together with others, from which benefit can only be achieved when one's turn arrives to make use of the money in the kitty. This system is found in many places in Africa under different names. Also in South Africa is the concept of Masakhane, i.e. "Nation building" which implies sacrifice by some to assist others, which is a typical traditional African value. In the African mind freedom from colonization was long overdue during the hundreds of years of oppression, but the 'right time' had to arrive first. For many generations the oppressors were tolerated, and action was only taken this century. Patience endures over many generations and an outcome is not demanded in one's own generation. In the present developed world, it seems patience is an unknown concept, as mainstream culture is driven by the "now" generation's motto of life: "I want it, and I want it now!" Although there is still an incredible amount of violence in Africa, there is also an incredible degree of forgiveness. In Africa, traditionally human roles were seen in cosmological terms, and violence had to be condoned by the ancestors. The breakdown of traditional values destroyed the cultural borders and limits of many individuals, but to the majority forgiveness comes relatively easy, as is evident from the efforts of the post-apartheid South African Truth and Reconciliation Committee. The role of justice is the good of the community, as opposed to the developed concept of individual justice. In practice this African view may often result in mob executions, but contrary to the views portrayed in the hype of mass media, actions are never driven by mass hysteria, rather by the common good of the group. African crowds may seem to be out of control (and indeed some are) but Africans are much more expressive of their emotions than reserved Westerners. In Africa justice does not consider the rights of the individual before the group. A major challenge for actors would be to determine how new media would fit in with the values of cultures who are not economically or materialistically driven. How could the new media support value systems such as the above? The latter part of this century has seen a shift towards political and economic democratization, but perhaps even more astounding, a shift to the democratization of information. Notice the growth of web content, contributed to by a range of people from professionals to school children. This democracy is presently, however, an elitist democracy -- only "haves" have access to the magnitude of information. "Have nots" are still the victims by being informationally poor. And these "have nots" are also found in developed nations. In regions such as Africa, however, the notion of political democracy is not the same as held by the West. The benefit of democracy should not focus on political democracy, but informational democracy, meaning access by all to all informaiton. Victims are not only the economically poor, but also informationally poor. If knowledge enables self-empowerment, it is not political or economical democracy that is important, but informaitonal democracy. 7. How do we solve the problems of victims? The assumptions on which the effort of actors are based to connect the victims with new media are biased, and based on specific ideological views of the world. In order to truly assist victims, actors have to rid themselves of biases, and think outside their own restricted mental boxes. It is necessary to reinterpret societies and their needs in a revolutionary manner, rather than in terms of classical evolution. A radical incision is the only tool that may ensure a better chance of evolutionary survival. A revolutionary approach to assisting the victims is thus needed. The motto of actors should be: By helping them, we'll be helping ourselves. This may not come across altruistic at all, but is based on the symbiotic notion that systems should be in equilibrium for their future existence. Solving the problem of economic poverty, as well as technological poverty and information poverty requires a revolutionary shift in our paradigms of thinking about the victims. If the new socioeconomic revolution is a shift toward an information era, as commentators predict for the 21st century, we need a revolutionary shift in our system of morals and world view - a view not driven by economics. The needs and requirements of the victims need to be expressed by themselves, and not being imposed onto them by actors -- as the majority of the aid schemes of the past have actually done. Even though I may have been critical of the illusion of globalization and technology, they are nevertheless necessary. Access to information (eg. on health and agriculture) does improve the living standards of the poor. Actors thus need to provide developing nations with tools to access appropriate information - and not focus on some or other notion of economic development. If information technology systems, as found in highly developed regions seem either impractical or not affordable in developing regions, perhaps high technology is not the answer, or right solution. The World Bank may want to half poverty by 2015, but even if that goal is achieved there will still be many poor people. Today almost 20% of global population live on $1 a day. If that is halved to 10% by 2015, given no population growth at all, there will still be at least half a billion people living on $1 a day, and they will still definitely be more interested in food than technologies for communication. Delivery systems remain the main stumbling block for accessing information. And it is here where the real challenge lies. Access devices require energy, but global power supply does not seem to be possible even within the next hundred years. Individualized power supplies seems to be the answer. One such solution is a hand-driven generator that stores enough energy to drive a radio, cell phone and even computer. By using such a low-tech solution for delivery, it may indeed be possible to connect even the poor. However, a single unit costs about as much as the annual income of the poor. There is thus no hope that the poor will will be able to afford this technology. If energy is a scarce resource in developing regions, low energy devices that could be powered by low technology, such as human-driven dynamos, may be one of many possible solutions. Instead of internet access, perhaps radio is the most relevant medium. 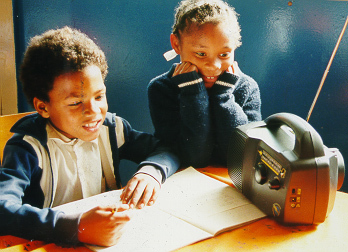 Educational programs could be run for schools, using wind-up radios to listen to "classes". Such radios could also be used in the fields, and workers could be educated while they are working. Timeous agricultural information could perhaps even be broadcast in particular seasons, pointing out possible problems with crop that workers should look out for. And if this is done in the form of edutainment, workers may even enjoy such programs. Figure 14. Using radio in a remote area. This low-technology solution has already had some success in Africa where access of agricultural information, for example, and health tips have led to an increase in living standards. It has also brought a lot of joy to many people. This energy source is currently being developed into a general purpose generator that can drive delivery systems ranging from cell phones to portable computers. But delivery systems do not need to be that sophisticated to provide the developing world with access to information. Radio does the trick well, and so can other low-cost delivery systems. Who are the world's actors and who are the victims? The answer depends on a specific ideological viewpoint. With reference to classical economic theory, the western world may be the actor in terms of economics. With reference to other value systems, such as held by traditional African cultures, the western world may be regarded as victims of their own greed. The notion of globalization of technology and information is a relative concept. Not even in highly developed regions is every single individual connected to the internet, and in fact, not even traditional media has a 100% penetration. It is highly doubtful that every single individual on this planet will be connected to the new media even over the next century. Actors will not remain actors if weak inputs into the system may take a system so far from equilibrium that it results not only into total chaos, but dissipate into nothingness. Given this complex systems view of moral responsibility, actors need to take victims by the hand and lead them into the information era. But perceived victims may lead actors into a world of different morals. Co-participation in changing societies to using technology is required for the long-term benefit of humanity. The information era is not a solution to the world's problems, specifically not if classic evolutionary theory is at the basis of the argument. A revolutionary approach to information technology is required to assist the victims of this world.